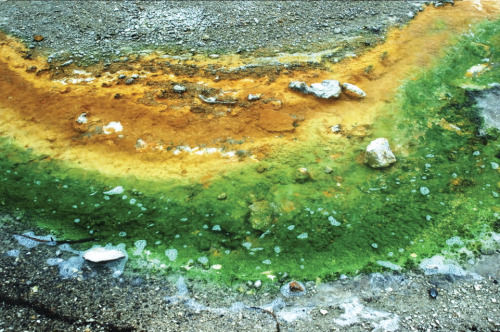 The colour of money: closeup of thermophiles in the heated water of Yellowstone National Park. 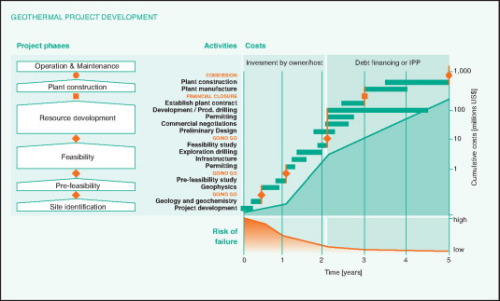 Figure 1: Geothermal Project Development - Geothermal project phases and their related costs and risks on a timeline. Example from a 100 MWe plant in the Philippines (source – Randle, 2001, modified). Figure 2: Typical project timeline and financing options of a high enthalpy project in the USA (source – Glitnir, 2008, modified). Until recently, most investors have largely ignored geothermal technology. But in the past two to three years, investor interest in geothermal technology is finally catching on – with increased recognition of the huge potential to be tapped. Kai Sametinger of forseo GmbH asks what has triggered this new interest surrounding the art of investing in geothermal. With geothermal, as with other alternative energy technologies, there have been plenty of drivers: accelerated global demand for energy, extraordinary increases in the price of oil and a growing awareness of the need for carbon-free energy sources. In many countries, these translate into stronger policy support for renewable energy. A greater awareness of the benefits inherent in geothermal energy now seems to be helping to remove some of the existing barriers. Most of all, the base-load capacity of geothermal power plants can now be seen as a comparative advantage. A key impulse came from Iceland, when companies like Glitnir Bank or Geysir Green Energy – combining know-how and capital – seized the international market with a concerted effort. New technology development, as demonstrated with the recent success of commercial low temperature power projects in Alaska and Germany, makes geothermal more competitive. A comprehensive report by the Massachusetts Institute of Technology (MIT), released in early 2007 heralding the enormous potential of Enhanced Geothermal Systems (EGS), clearly invigorated the market. Investors took note of a cutting-edge technology that has the potential to access the earth's vast stored heat resources to help meet the world's energy needs. In EGS, also known as Hot Dry Rock or Hot Fractured Rock, wells are drilled, and water is injected under high pressure, which creates an artificial geothermal reservoir at depth. Water is circulated through the reservoir, extracting heat from the rock for use in producing geothermal electric power using a binary power plant. The US Department of Energy (DoE) estimates that the application of EGS technology in the USA is capable of providing at least 100,000 MWe of electricity within 50 years. With a modest R&D investment of US$1 billion over 15 years, the MIT report estimated that 100 GWe of electricity could be installed by 2050 in the USA. It doesn't come as a surprise that Google's US$10 million investment in geothermal aims at EGS, sending out another strong signal to those who are still hesitant. Google.org, the philanthropic arm of the search engine company, supports AltaRock Energy Inc, a company developing proprietary technology advancements, designed to lower the cost of EGS electricity generation. After successful completion of an EGS demonstration project, AltaRock hopes to begin commercialisation of EGS beginning 2010. Another beneficiary is Potter Drilling, a developer of deep hard-rock drilling technology. Specialised drilling companies play a key role in further advancement, as drilling is an essential part of geothermal exploration, development, and utilisation. The objective of advanced drilling technology is to promote ways to reduce the costs and to access hard to come by geothermal resources. Furthermore, the design of drill heads capable of withstanding very high temperatures is a challenge. The international Iceland Deep Drilling Project (IDDP) aims at electricity production from so far untapped geothermal resources, so-called supercritical hydrous fluids from drillable depths. Production will require the drilling of wells at temperatures of 450-600°C. Supercritical geothermal systems could potentially produce up to 10 times more electricity than the geothermal wells typically in service around the world today. While the IDDP is exploring new dimensions of tapping geothermal, EGS technology has been successfully demonstrated by a European research project in Soultz sous Forêts (France). After 20 years of research, electricity production of the world's first Hot Dry Rock plant started in June 2008. This success is important in proving the technological feasibility, yet there are questions as to the economic viability, as the research project was financed entirely by public funds. The answer might come from the other side of the globe: Australian companies are leading the way with major investments in EGS technology and the first commercial power plants are expected to be online soon. Investors' increased interest is vitally important for the geothermal industry, as the lack of capital available to geothermal projects, especially during early development stages, stifled the growth of geothermal technology worldwide and continues to pose a major challenge for the sector. Yet, while market confidence is growing, geothermal projects still have to bear multiple risks and investors are well-advised to act with prudence. It can be very difficult to determine which geothermal developers will succeed and which will fail as some might depend too heavily on the fate of single projects. Thus knowledge and experience are needed in any geothermal development. That applies not only to the developer but also to financial institutions and investors. Most geothermal power projects take five to 7 years to be completely operational, depending on permits and other licensing issues. Each geothermal project phase, from site identification to operation and maintenance, has its own scheme, its own set of activities and requires different equity and financing solutions with very different risk profiles. For economic success, it is important to understand that the subdivision in project phases reduces the risk because go/no go decisions can be made at the end of each phase (see figure 1). Financial applications depend greatly on the success of drilling, which is ultimately determined by the volume, temperature and pressure of the fluids discovered. Drilling is a very expensive part of any geothermal project, representing up to 60%–70% of the overall geothermal project cost in Germany and 30%–40% of the overall project cost in the USA. While the percentage varies greatly for other regions, in all cases the potential for unsuccessful drilling represents a high risk factor. Given this high risk factor, traditional debt is usually not available in the early stages of a geothermal project – not until the resource has been successfully proven. In some cases, Government support and subsidies are helping projects to get off the ground. Public support schemes, however, differ from nation to nation and are never able to completely cover costs. In the end, all projects depend heavily on the open market for their financing needs. Figure 2 shows financing options from an equity and banking perspective through the project's development stages. While options have been limited in the past and the risk reward balance has prohibited developers from accessing most traditional sources of equity, there is evidence that the tide may be turning. In 2007 private equity firms invested more than US$400 million in geothermal energy, and US$3 billion was invested in disclosed deals, an increase of 183% from 2006 (Source: New Energy Finance). Large energy and utility companies are now moving into the industry, expanding collateral options for investors. In addition, specialised financial institutions have started developing alternative financing instruments to bridge the financing gaps. One example is Icelandic Bank Glitnir's ‘resource verification loan,’ a hybrid mezzanine vehicle that was used to cover the cost of drilling and testing the two initial production wells for a geothermal power plant in California. All geothermal projects have to bear multiple risks until the resource has been proven: reservoir-related risks, risks from natural hazards, production-related risks, technical risks, financial risks and legal risks – and each has different probabilities and impacts. As exploration and drilling constitute major upfront investment components, reservoir risk is a real hurdle for an investor in a geothermal project. This is especially true for low-temperature projects in case the necessary flow rate cannot be reached, resulting in high economic risk – i.e. a total failure of the project. Yet, reservoir-risk transfer can be a viable instrument to mitigate the risk of lower than expected heat extraction. The insurance industry has, albeit faint-heartedly, responded to the challenge by offering coverage for reservoir risks at locations that are geologically well-defined. Reservoir-risk insurance reduces the need for equity through partial coverage of costs should the project become uneconomical. Reservoir-risk insurance might be one vehicle that will further accelerate worldwide geothermal development. More and more, the huge geothermal energy potential in many regions of Asia, Africa and Latin America is starting to outweigh the prevailing risks, in large part due to an increasing number of Governments helping to bring foreign investors into the picture, particularly for renewable energy businesses. Geothermal energy development and investment is clearly picking up pace and has gained the momentum it needed. Glitnir forecasts considerable consolidation in the coming years as cash-poor smaller players get absorbed.